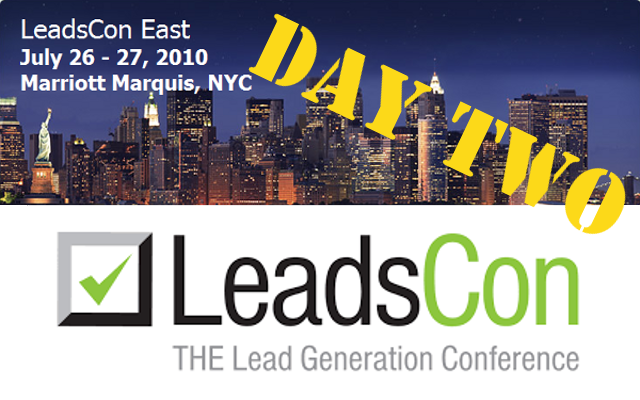 The second day of LeadsCon was interesting than the first day – and it appeared that more people were in the audience too. During a session called “The Billion Dollar Business?”, panelist Brett Markinson, Co-Founder and Chairman of HauteLook, Inc., spoke of natural language bots that would help qualify individuals for conversion; but the best session of the entire conference, from a B2B perspective, was titled “How to Contact: Man vs. Machine.”Ken Krogue, President and Co-Founder of InsideSales.com, explained the results of an interesting research project his company commissioned MIT to conduct analysis of B2B and B2C multimedia response time effectiveness. InsideSales.com is a leading telephony-based lead management application with a robust callback solution that integrates with Salesforce.com. The Marketing Consigliere thinks this is a good read, along with some of the other research papers that InsideSales.com has provided. Irv Shapiro (@irvshapiro), CEO of Ifbyphone, indicated that phone selling was growing at a 15% rate as compared to face-to-face selling. His company helps businesses reduce costs and improve customer satisfaction by automating call handling and management with solutions for outbound notifications, call tracking and analytics, voice self-service and virtual call centers. The Marketing Consigliere met Mani Iyer (@iyermani), Founder and CEO of Kwanzoo, which helps marketers quickly create interactive, content driven campaigns. While Kwanzoo is clearly for B2C, there is no reason why the app cannot be used for B2B marketing purposes. Regarding the exhibitors, clearly this was the world of hard driven, quick transaction, quickly close B2C marketers. Most vendors spoke about leads for home mortgages, credit advice, health insurance, and higher education. Like yesterday’s dismal showing of hands by drip marketers, there was no substantial talk of nurturing or scoring in the same context as a B2B marketer would. One shining light on the floor was the TARGUSinfo booth. Stephanie Richman, their Director of Operations and Account Management, explained to The Marketing Consigliere that her company has a solution for companies needing to validate and qualify a B2B lead visiting their website, providing verification such as if who owns the domain from which someone is visiting, and Hoovers-like information to help guide a marketer or sales person as to the veracity of the lead. Well, while this was an interesting glimpse into the B2C world and there were some points of light for the B2B Marketer, The Marketing Consigliere is glad that he had other business in New York and did not make the trip just for this event – while inexpensive, it was not a content-rich environment for B2B Marketers who have to generated leads, and then nurture and score them for handoff to sales. Jep, (@jepc), you were indeed smart in avoiding this event, especially given your west coast location. And any other reader of this blog would be wise to stick to lead generation and management events that are strictly for B2B and sponsored by the marketing automation vendors.